Jazz Legend, Chris Barber, celebrates his 67th year as a band-leader with a Europe-wide tour, calling in at The Apex on 27 June. Inspired by the 'King Oliver Creole Jazz Band', Chris formed his first band in 1949 at the age of nineteen and has since gone on to become not only Europe's most successful and influential bandleaders, but a bona fide jazz legend. Without compromising his high musical standards, this giant of the British jazz scene has displayed a rare ability to adapt and promote seismic changes in jazz music. In over half a century his bands have travelled across musical genres to embrace traditional jazz, blues, R&B, skiffle and even gospel. He is widely admired by many musicians, not just as great trombone player, but as someone who, almost single-handed, brought jazz and blues music to the UK in 1950s and 60s. Chris introduced American musicians like Muddy Waters, Howling Wolf, and Big Bill Broonzy to audiences here and in Europe. It is often said that without Chris Barber there would have been no Beatles or Rolling Stones. “…he changed my life and probably yours, too, because he changed the course of popular music: the trombone legend, Chris Barber” – Hugh Laurie He’s played with most of the greats in the jazz world including many contemporary artists such as Van Morrison, John Mayall, Eric Clapton, Dr John, Bill Wyman and Mark Knopfler. The Big Chris Barber Band feature everything from New Orleans to blues to late '20s Ellington, played with extraordinary panache and skill. The Band is not just a testament to the bandleader’s longevity; it includes some of the best individual jazz musicians around and promises to deliver an exhilarating evening of quality jazz and blues, appealing in equal measure to hard-core jazzers, newcomers, young and old. The Big Chris Barber Band appear at The Apex on Monday 27 June at 7.30pm. 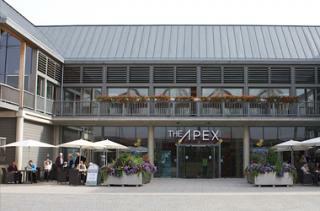 Tickets are £22, call the Box Office on 01284 758000, or visit www.theapex.co.uk for more information, or to book your tickets.